My husband is so cute. Like really, honestly, one of the most adorable men I have ever met. One night a week, I have a three-hour night class, leaving hubs to fend for himself....sometimes I'll stick something in the crockpot, but more often than not, he has to come up with something on his own. When hubs was first left to his own nutritional devices (like seven years ago), he lived primarily on Lipton Sidekicks, dining on such delicacies as instant risotto, scalloped potatoes, or the perennial favourite, teriyaki noodles. It was in this state that I found him....a connoisseur of sodium, preservatives and articifical flavouring. In the last six years, hubs has discovered the joys of virtually any cuisine (he's way less picky than I am) and has actually started to cook a bit. And spaghetti is his specialty.....usually he fills it with ground beef, lotsa garlic and all kinds of other yummy things. Due to my newfound aversion to grocery-store meat, meat has been in scarce supply....so hubs decided to make himself a big pile of veggie spaghetti for dinner, while I was away trying to get smarter. 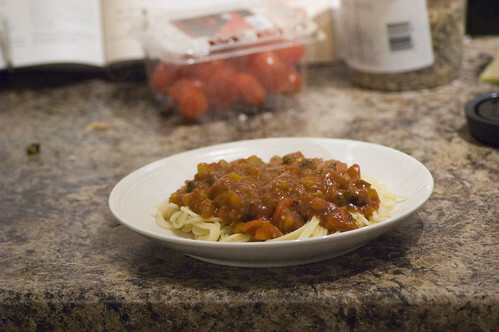 Not only did he make AWESOME spaghetti, he actually took pictures and documented it for me. 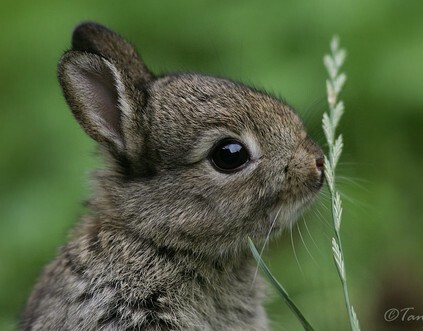 How darn cute is that. Hubs is a far better photographer than I am....if you like haunting amazing places, you can check out some of his stuff on flickr. He typed out his recipe and everything....and he actually one-upped me on the photos - I usually just crank the ISO to 1000 so I don't need to drag the tripod into the kitchen.....he actually the tripod all set up too! Granted, that tripod has been in some pretty sketch places.....but really.....he's so cute. What a guy. 1. Cook spaghetti according to package directions. Using a deep frying fan, pour enough olive oil to spread out and barely cover the bottom. 2. Shake in a healthy amount of Montreal Steak Spice. 3. 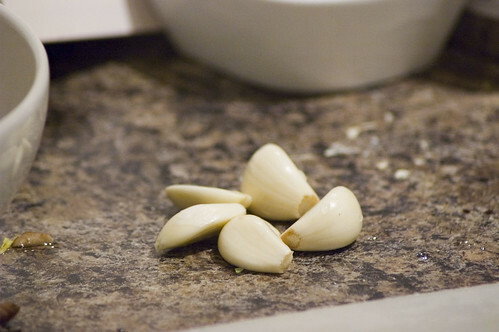 Press the garlic into the pan and stir on medium heat. 4. 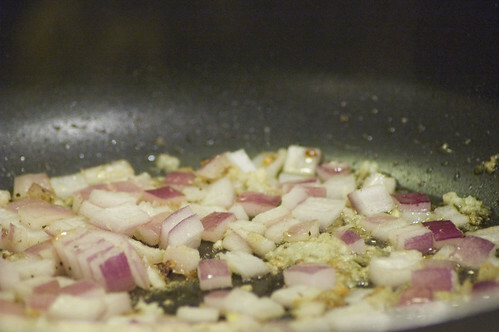 Add red onion and continue stirring. veggies (celery, peppers) and leave the softer ones (mushrooms, tomatoes) for last. 6. While stirring, season to taste... I added a few shakes of dill weed and thyme. 7. Add pasta sauce and simmer until your pasta is ready. :) Thanks for reading! Stay tuned for steak and potato madness! Hi, I really like your blog, so I've added you on mine!! I wonder if my wife would say similar about me?